This section hosts plant species that live in sandy and rocky coastal habitats. 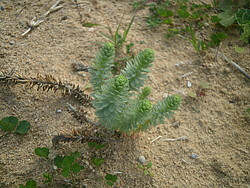 Visitors have the opportunity to see samples of psammophilous plants, such as Ammophila arenaria, Achillea maritima, Eryngium maritimum and Medicago marina that have adapted in order to live in the first lines of coastal sand dunes (embryo and yellow dunes). Their extensive systems of creeping underground stems or rhizomes allow them to thrive under conditions of shifting sands and high winds. 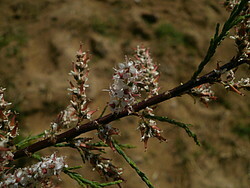 Halophytes plants, such as Tamarix parviflora, have adapted in order to live in conditions of high salinity that characterizes seashores habitats. They can maintain a 'normal' internal salt concentration by excreting salts in excess through their leaves and stems or by concentrating salts in leaves that later die and drop off. 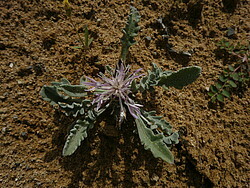 Xerophytes plants, such as Centaurea spinosa and Pancratium maritimum have also adapted in order to survive in a dry environment, by reducing their water loss or by storing water during long periods of drought. 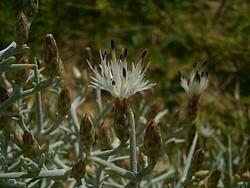 During the different seasons visitors can observe many annual plants such as Cakile maritima, Salsola kali, Matthiola tricuspidata and Silene colorata. 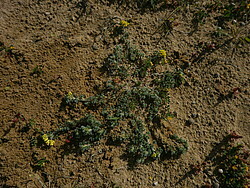 There are also species such as Crythmum maritimum, that grow predominantly in narrow cracks and fissures in rocks and species such as Juncus spp. 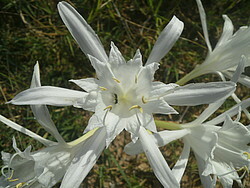 and Limbarda crithmoides that grow predominantly in salt marshes. Small trees and shrubs such as Juniperus oxycedrus var. 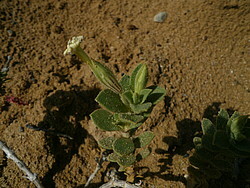 macrocarpa and Limoniastrum monopetalum are also part of this section. 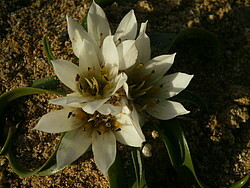 Visitors have the opportunity to see endemic or rare species such as Androcymbium rechingeri, endemic to Crete, and Phoenix theophrastii, endemic to Crete and southwestern Turkey. Coastal ecosystems are of great naturalist interest, but they are also highly vulnerable and seriously threatened by human activities.